Untitled by Gavin Jantjes, South Africa.1989-1990. Materials: acrylic on canvas. Purchased with funds provided by the Smithsonian Collections Acquisition Program. A new art exhibit highlights the fascinating link between astronomy and culture, exploring how cosmic wonders, such as the sun, moon and stars, inspired ancient and contemporary art in Africa. The exhibition, called "African Cosmos: Stellar Arts," is on display through Dec. 9 at the Smithsonian's National Museum of African Art in Washington, D.C. The show, which opened on June 20, includes about 100 objects that interweave celestial phenomena with African art, demonstrating the strong allure of the cosmos among human beings from ancient times to the present. "This exhibition, many years in the making, is part of the museum's series focusing on Africa's contributions to the history of knowledge — in this case, knowledge about the heavens and how this knowledge informs the creation of spectacular works of art," Christine Mullen Kreamer, deputy director and chief curator of the National Museum of African Art, said in a statement. "The project connects my lifelong fascinating with sky-watching to the arts and cultures of Africa, which for decades have been my passion and the focus of my professional work." According to museum officials, "African Cosmos: Stellar Arts" is the first major exhibit to explore the intersection of cultural astronomy and African art. The display features ancient Egyptian and Nubian artworks in wood, stone and papyrus, 19th- and 20th-century masks and ritual objects crafted by artists from regions south of the Sahara, Smithsonian officials said. Works inspired by the cosmos from several internationally recognized contemporary artists, including El Anatsui, Julie Mehretu and Berco Wilsenach, are also part of the exhibit. Other highlights of "African Cosmos: Stellar Arts" include an ancient Egyptian mummy board that is decorated with a representation of Nut, the sky goddess, sculptures honoring Shango, the thunder deity, and his wife Oya, deity of the whirwind, and a sculpture called "Trembling Field" by South African artist Nel that explores how light diminishes into the vastness of space. The National Museum of African Art is dedicated to the collection and conservation of traditional and contemporary African arts. 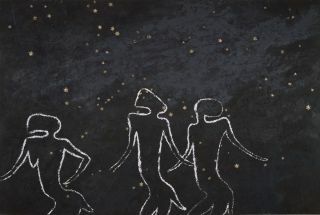 The "African Cosmos: Stellar Arts" exhibit is sponsored by the government of the Republic of South Africa and South Africa's Department of Science and Technology. Additional support comes from BET Networks, Stuart Bohart and family, Brand South Africa, Credit Suisse, South African Airways, South African Airways Cargo and the Embassy of South Africa in Washington, D.C.